(1976). The film dealt with a village story, to which Ilayaraja composed great melodies. The songs offered simplicity and musicality typical of Tamil folk in an authentic way, and they offered new sounds--rich orchestration typical of Western music. The songs became an instant hit, the most popular being "Machchana Partheengala" sung by a female voice, 'S. Janaki' . This was followed by a series of films that portrayed contemporary Tamil villages in an authentic way, against stylistic shallow portrayals before. For all of these films Raja created memorable songs. Most popular were the songs "Senthoorappove" and "Aatukkutti Mutaiyittu" from In 1969, Raja migrated to the city of Madras, the Southern Movie capital, when he was 29 years old, looking for a break into music making for the public. He studied under Dhanraj Master, playing the guitar and piano in the Western style. He later earned a diploma in music from Trinity College in London. 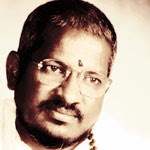 Ilayaraja's break into music for films came with AnnakiliPathinaru Vayathinile (1977), and "Samakkozhi" and "Oram Po" from Ponnu Oorukku Pudhusu (1979). Raja soon proved his abilities in other styles as well. classical Karnatic melodies were used in Kannan Oru Kai Kuzhandhai (1978) (Rag Mohanam), Mayile Mayile (Ragam Hamsadhwani), and Chinna Kannan Azhaikiran (Reethi Gowlai). Raja's grasp of Western classical structure became evident with his masterful use of the piano, guitar, and string ensembles. Some of the numbers that show his orchestral genius are "Pon malai Pozhudu" and "Poongadhave" from Nizhalgal (1980), Kanmaniye Kadhal from Aarilirindhu Aruvathu Varai (1979), "Ramanin Mohanam" from Netri Kann (1981), "En Iniya Pon nilave from Moodupani (1980), "Paruvame Pudhiya" from Nenjathai Killathe (1981), and "Edho Moham" from Kozhi Koovuthu (1982). These songs could literally be heard coming from every doorstep in Tamil Nadu state every day for at least a year after being released. Raja composed film music prolifically for the next fifteen years, at a rate of as many as three new songs a day. After a few years as a film composer, he could write all the parts to a score as they came to him, and his assistants would make fair copies, which would be recorded immediately. Raja went for a trip abroad to Europe, partly to visit places where 'Wolfgang Amadeus Mozart' , 'Johann Sebastian Bach' , and 'Ludwig van Beethoven' lived. They were his Manasika Gurus or non-physical teachers, he wrote once. He also met contemporary composers and arrangers including 'Paul Mauriat' . His listeners were awestruck by the quality and quantity of his musical output. He also scored a few films abroad. Ilayaraja's image grew to be a unique one in the history of Tamil cinema: stories, themes, and castes would be changed to fit his music, which swept away the minds of millions of Indians in hundreds of films. Ilayaraja also recorded non-film albums, such as "How to Name It" and "Nothing But Wind," which were well-received in India and abroad. In 1993, he wrote a symphony for the London Philharmonic Orchestra in an amazing one-month span. To many people who know him, Raja represents more than his music. He is a mark of great achievement that is possible by hard work, yet he is seen in most of his interviews as talking very philosophically. He is very much attracted by the philosophy of Ramana Maharishi of Thiruvanna Malai, who lived in the early 20th Century. Raja once referred to Ramana as "our Zen master."